NOTE: These instructions will only work for campus-issued desktops on the wired campus network. This will not work for personally owned devices. Your computer will search all locations and computers in your network workgroup, which will take a minute or two. In order for a network printer to be shared, both your computer and the printer must be members of the same domain (or workgroup). We will cover the steps needed to connect to a domain in the next portion of this lesson. If the printer is attached to someone's computer, the driver will be downloaded and installed from the host computer. If the printer came with a driver disc, you can install the driver on your computer and then install the network printer. Windows includes a large driver database for many printers. If the local database does not contain the driver, you can connect to Windows Update and search for a driver that way. 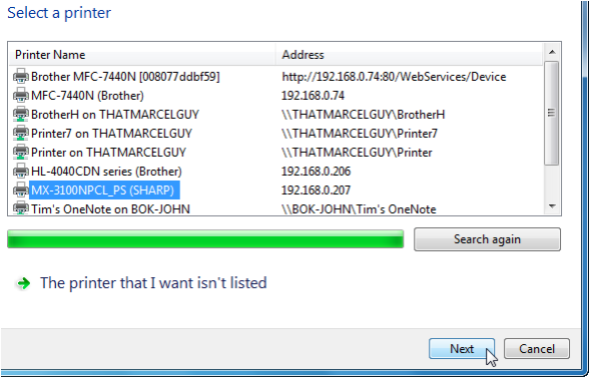 You can download the printer driver from the manufacturer's Web site and install it as if you were using a driver disc.